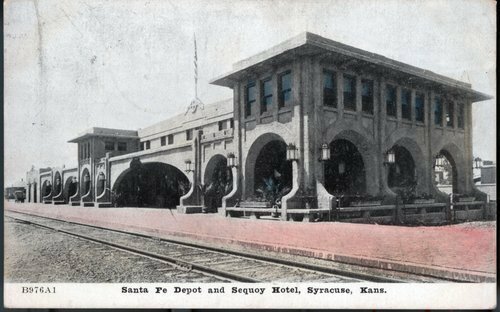 This photograph shows a view of the Atchison, Topeka & Santa Fe Railway Company depot and the Fred Harvey Sequoyah Hotel in Syracuse, Kansas. The facility designed by Louis Curtiss opened in 1908 and provided service until closing in 1936. The building was razed in 1972.